The White Hat – Italian Frozen Yogurt company, purveyors of the country’s creamiest authentic frozen yogurt from Italy invites everyone to celebrate VALENTINE’S DAY in three ways. First, TWH has come up with a special VDAY combo composed of fresh strawberries, fruity pebbles, and dark choco drops drizzled with swiss chocolate syrup, all on top of freshly made yogurt. 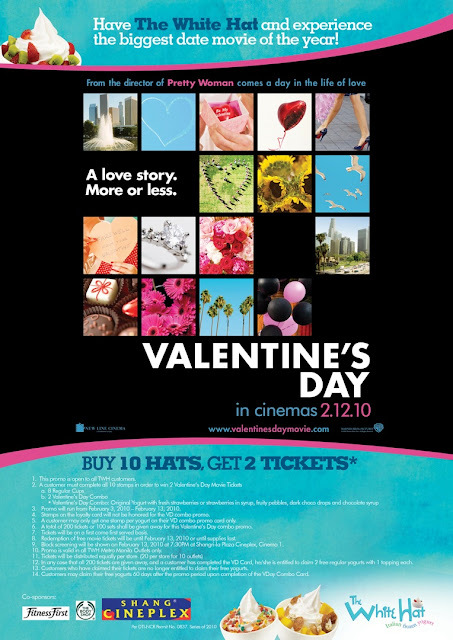 Second, customers can win two free tickets to watch the most-awaited date movie of the year – “VALENTINE’S DAY” featuring an all-star cast. All they have to do is complete a COUPLE’S CARD whereby two partners will each complete one side of the card and if they are one of the first 100 couples to submit, they win two free tickets to the movie. OR they can just tune in to MAGIC 89.9 from 3 pm to 10 pm, Mon-thurs, and wait for the cue to call the station. OR they can check out TWH’s facebook fan page for free tickets. Finally, TWH offers customers a chance to share their LOVE with the less fortunate by inviting them to drop by SHANGRILA MALL on Feb 13, 1 pm onwards and buy some yogurt because on this day, half of the day’s sales will be donated to AHON FOUNDATION (to help build libraries for public schools). And guess what? The ATENEO BLUE EAGLES will be there serving yogurt too! So, this VDAY, do check out TWH as they give you a way to celebrate VDAY in 3 ways!